The commission was established under the 2007 Indian Residential Schools Settlement Agreement. The schools were established and paid for by the Canadian government in the late 1800s, but were administered by church organizations of several religions, including the Catholic Church, which ran about 60 percent of them. The report, issued June 2, ended a five-year mandate to create a public record of the tragedy of Indian residential schools and to examine the ongoing fallout of a 130-year policy that separated 150,000 native children from their families. 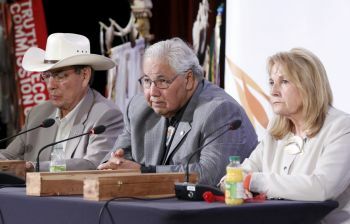 By witnessing the stories of many of the 80,000 survivors and documenting the cultural and societal devastation to families torn apart, the commission said it hoped to cultivate reconciliation between aboriginal people and the rest of Canada. “Cultural genocide is the destruction of those structures and practices that allow the group to continue as a group,” said the commission’s final report. “States that engage in cultural genocide set out to destroy the political and social institutions of the targeted group. Land is seized, and populations are forcibly transferred and their movement is restricted. Languages are banned. Spiritual leaders are persecuted, spiritual practices are forbidden, and objects of spiritual value are confiscated and destroyed. And, most significantly to the issue at hand, families are disrupted to prevent the transmission of cultural values and identity from one generation to the next. “In its dealing with aboriginal people, Canada did all these things,” it said. The report documented incidents of abuse and neglect in the schools and published testimony from nationwide hearings it held. In some cases, it said, pubic officials and even parents refused to return children to the schools. Citing statistics from the chairman of the commission, Justice Murray Sinclair, the Canadian Broadcasting Corp. reported that the odds of students dying in residential schools — 1 in 25 — were about the same as Canadians dying in World War II — 1 in 26. Its 94 recommendations covered a spectrum of aboriginal rights, including those concerning health, education, languages, equity in the legal system, and reconciliation. It called for increased funding and support for substance abuse treatment. Governments on all levels must ensure that aboriginal families stay together as much as possible, the report said, and it and listed recommendations on foster care, culturally appropriate parenting programs for aboriginal families and spending by child-welfare agencies. Among its recommendations for changes to the Criminal Code of Canada were that trial judges, upon giving reasons, should be allowed to depart from mandatory minimum sentences for aboriginals. In a section on the 15th-century church-based Doctrine of Discovery, it discussed the complex role of religions in colonization and the idea that the lands being claimed were “terra nullius” — no man’s land — and therefore open to claim. The report noted that in 2010, the Vatican’s representative to the United Nations indicated that “circumstances have changed so much that to attribute any juridical value to such a document seems completely out of place,” although some felt that the comments were insufficient repudiation of the Doctrine of Discovery. 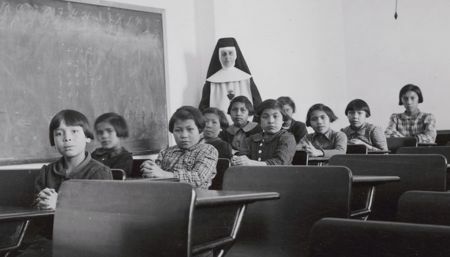 In this 1940 photo, a group of female students and a nun pose in a classroom at Cross Lake Indian Residential School in Manitoba. The Truth and Reconciliation Commission ended a five-year mandate to create a public record of the tragedy of Indian residential schools. (CNS photo/Library and Archives Canada, Reuters) See CANADA-RECONCILE June 3, 2015. Editors: editorial use only. 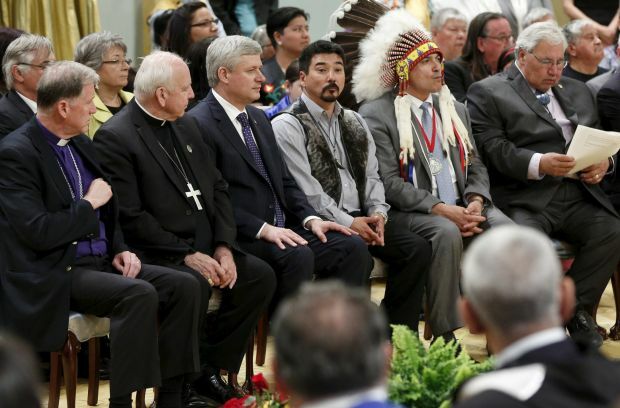 The commission said that, for more than a century, thousands of children “were subjected to spiritual, emotional, physical and sexual abuse in Catholic-run residential schools. 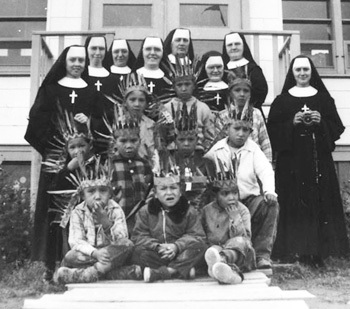 Other than a small private audience with Pope Benedict XVI in 2009, the Vatican has remained silent on the Roman Catholic Church’s involvement in the Canadian residential school system. “During the commission’s hearings, many survivors told us that they knew that the pope had apologized to survivors of Catholic-run schools in Ireland. They wondered why no similar apology had been extended to them,” it said. Archbishop Gerard Pettipas of Grouard-McLennan in Alberta, who chairs the committee of Catholic entities that ran residential schools, told Canadian Catholic News he had no idea how to make that apology happen. Invoking a deadline and insisting an apology happen in Canada makes it even more difficult, he said. “It’s for the church in Canada to be involved in further gestures, not for the Holy Father,” he told CCN. He said it had been difficult for the commission to understand the Catholic Church’s decentralized structure, in which every bishop “is solely responsible for his diocese” and is independent. Not even the Canadian Conference of Catholic Bishops can speak for all the bishops, he said. In Australia, where Aboriginals were separated from their families, the children were raised at church-run missions and sent into the work force as farm laborers and domestic help. Many did not know their original identity or where they came from. Their stories of generational dislocation and loss were collected in “Bringing Them Home,” a government-mandated human rights report published in 1997. At the Synod of Bishops for Oceania in 1998, Australia’s bishops expressed their sorrow at the plight of the Aboriginal people and the church’s past involvement in the destruction of their familial ties, languages and culture. In 2008, Australian Prime Minister Kevin Rudd apologized to Aboriginals in a speech before Parliament. Rudd spoke of the “profound grief, suffering and loss” experienced by an estimated 50,000 indigenous people over 70 years of government assimilation policies predicated on separating Aboriginal and Torres Strait Islander children from their families and homes. The indigenous peoples of those decades are now referred to as the Stolen Generations.